Many people love the look and feel of a sunroom, but are just not sure how to go about getting one in their home. While most homes have a room that can be quickly be turned into this bright area of the home, most others will require an actual addition. No matter what your home design is, King Group, CES can help you design the sunroom that meets your needs—and we can do it quickly and correctly. Often called conservatories, sunrooms have quickly grown in popularity due to their availability of year round use. Many people enjoy sitting inside a sunny room, relaxing with a favorite book, while it is cold and blustery outside. King Group, CES can go over every option for your home to help you create just the right feel for your sunroom. We can help you choose design options, heating and cooling systems, lighting, flooring, and many other aspects of your new sunroom. A sunroom can quickly add value to your home. Many people are currently looking to purchase homes that have sunrooms. 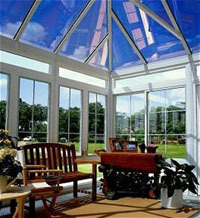 In addition, at King Group, CES, we can offer many energy saving options to your sunroom. This will help keep your utility bills lower while also helping our environment. We can answer any questions or concerns you may have about these environmentally friendly options. King Group, CES offers only the highest level of workmanship in our building projects. Customer service is also one of our top concerns. We have over 10 years experience as a builder and contractor, but we want to be certain each and every one of our customers is completely satisfied with our work. King Group, CES will stick by their written estimate and you won’t find us cutting corners. We take pride in the finished product, both in what you can and cannot see. When King Group, CES builds a sunroom, you know it will last. Quality materials, the finest workmanship, and the best client care are what separates King Group, CES from other builders. All of our work is guaranteed and we stand behind every project we build. For simply the best of the building construction, choose King Group, CES. For further information on Sunrooms call King Group CES on 045 838376or click here to complete our free online enquiry form.